Ghaziabad is a city located in the Uttar Pradesh state. It is also known as “Gateway of UP”. It is a large & planned city which is a part of National Capital Region of Delhi. Ghaziabad is an educational, industrial and commercial centre of western Uttar Pradesh. There are a large number of institutions located in the city those give a variety of options to the students to pursue their higher education in different fields. As per the census 2011, the average literacy rate of Ghaziabad is 84.78%. 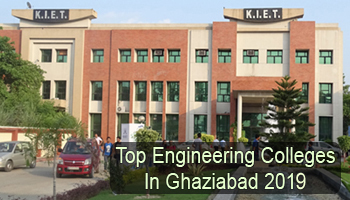 Through this article, students can check the list of Top Engineering Colleges in Ghaziabad 2019. Sarvgyan.com is providing a list of top engineering colleges in Ghaziabad 2019. This list has been created after a deep analysis. Here we have listed all the government as well as private colleges which offer various engineering courses in the engineering field. In our list, we have rated the colleges & institutions of Ghaziabad on several terms. Some major factors are college affiliation and approval, quality of education, faculty ratio, national importance, placement statistics, college infrastructure & facilities, student’s preferences and many others. Students seeking admission in B.Tech courses can apply through the national level exam (JEE Main) or state level exam (UPSEE). NTA organizes the JEE Main exam for providing admission in B.Tech & B.Arch courses. On the basis of GATE scores, students can apply for admission in M.Tech courses. In case of vacant seats, admissions may be done through the merit list of the qualifying exam. Engineering courses are available in different specializations. Some trending specializations are Aeronautical Engineering, Mechanical Engineering, Electrical Engineering, Electronics & Communication Engineering, Computer Science & Engineering, Civil Engineering, etc. For any other queries about Top Engineering Colleges in Ghaziabad 2019, you can leave your queries below.